Both the surrounding us nature and our own activities can be a source of emition of electrical waves which have a lot of electro-smog. The later is damaging to our body‘s cells. While some people are electro-sensitive, the majority of us can only notice the impact when it is too late. In other words, when our health has been already seriously deteriorated. Electronic smog is a byproduct of an electromagnetic wave. It occurs when electricity is generated (by generators) , transported (through cables or as radio waves) or used (in all devices which use electricity: from mobile phones, electric toothbrushes, lights in the car etc). Nowadays the amount of electronic smog is constantly growing. Its radiation interferes with our body‘s cells and is very harmful to your health. How your cell phone radiation harmful to you. Some human health studies and laboratory tests collected sufficient data to suggest that a long-term cell phone use could be linked to brain cancer, adverse effects on learning and memory, lower sperm counts. • Fertility Problems (Heavy use of a mobile phone can damage sperm, according to new research in the United states. A study into men with fertility problems showed that those who used the a mobile for more than four hours a day had a lower sperm count). • Disruptive Behavior Disorders (Mothers who use cell phone during their pregnancy are highly prone to having kids with behavioral problems). What is e-CHIP (I LIKE™)? 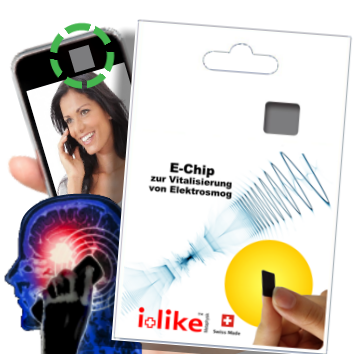 e-CHIP (I LIKE™) is a small chip which can be attached to your mobile phone and other electric devices in order to protect you from harmful rationation caused by EMF (electromagnetic frequencies) these devices produce. This product is based on the innovative techology developed by scientists from Switzerland in collaboration with international researchers and experts in the fields of physics, traditional and alternative health. They created a proprietary magnetite-mineral mixture which is embedded in a chip. After manufacturing, the e-CHIP is activated and charged by specific impulses generated through a special wave emission technology. Nowadays many people use mobile phones and send data daily through wireless network. This practice have already drawn attention of many experts and give rise to their strong concern. Everything that has to do with electricity produces the electro-smog too. So, everyone (children and adults) can benefit from having own e-CHIP. There is a mounting scientific data on high levels of human carcinogen caused by Mobile and Wi-Fi communication devices. Experts are calling for wider public debates regarding the safety of existing electromagnetic radiation and possible related illness such as cancer. For example, Prof Lennart Hardell, MD, has been studying a brain tumour risk associated with use of mobile and cordless phones for many years. Based on his findings, Dr Hardell is now strongly advocating against the use of mobile and wireless technology in schools. The e-CHIP coverts electro smog radiation into harmless by upgrading it to a positive bio-resonance. How long does e-CHIP effective for? It has a service life of at least 30 years. What do I need to do to use e-CHIP? Simply stick your e-Chip to your mobile phone, computer screen, on a lamp or the printer . . . and start experiencing a healthier environment at home and work! Can Mobile Phone Radiation Cause Cancer? 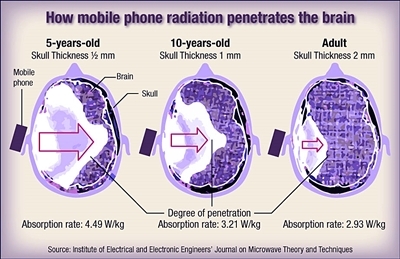 The non-ionizing radio-frequency (RF) radiation that cell phones and other wireless devices emit has a biological effect – it heats tissue by exciting its molecules. Results from that $25-million study (the National Toxicology Program under the National Institutes of Health in the USA), which tested 3,000 rats and mice for two years, and the study by the Ramazzini Institute in Italy provided the most compelling evidence that RF energy can be linked to cancer in lab rodents. These strong findings connected RF with cancers affecting the prostate, skin, lung, liver and brain as well as heart schwannomas and elevated rates of lymphoma in the exposed animals. The bad news for us is that our cell phones and other wireless devices emit EF radiation continually, even when we do not use them, because they are always communicating with cell towers. The dose intensity reaches the maximum level when these devices are used next to your head (during phone calls) or in front of your body (during texting).